How to draft an Authorization letter to claim an Identity Card on someone else's behalf? 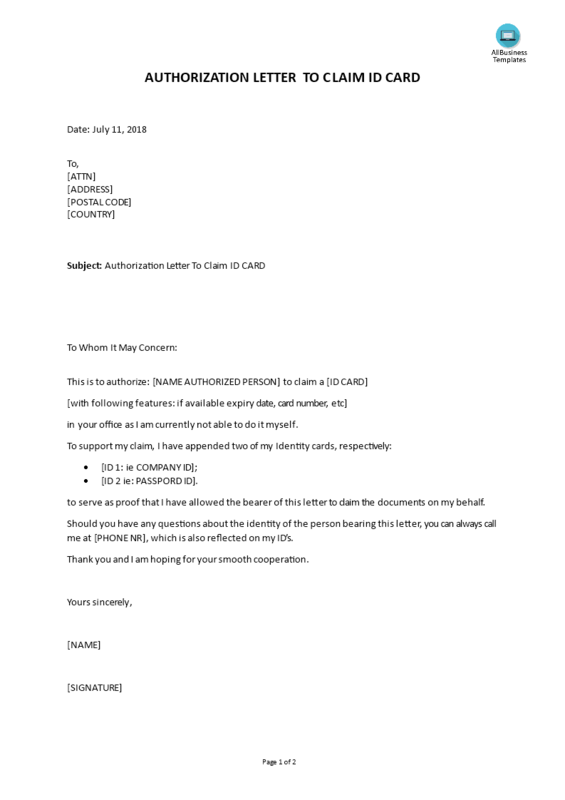 Download this Authorization letter to claim ID Card template now! This Authorization letter empowers somebody to collect an ID Card on your behalf. It is a useful letter template that enables you to draft a personalized version of your own very quickly. Especially if you will not be able to pick up the ID Card by yourself. It can also be used to ask for permission to carry out certain responsibilities, or to inform another person that you will be replaced by someone else so, to do your work on your behalf. This Authorization letter helps you to give someone the authority to go get you the ID Card. Writing an authorization letter for claiming an ID card has to be very specific and detailed. When drafting this authorization letter, consider that it should be formal. To get that letter that clearly conveys the message; you need to write in a particular way that includes the following. Intonation: you need to have a friendly tone but still keep it official since you are probably writing to someone you already know. Dates: make sure you specify the correct date so that the receiver can be aware of the dates you have delegated your authorities while you are away. Short and exact: make sure you keep it short and have just plain words there that are unnecessary, the letter should be brief but informative enough so the one who is receiving the letter so that you understand it. Be straightforward to the point. Informative: be specific and informative. Like all letters, you need to give detailed information. In this specific authorization letter, you are required to give the full details of the individual(s) who are being given the authority too. If you are looking for another type of Authorization letter to that are associated with such a power can be related to taking a decision, sign on documents, participate in some event, give a commitment, etc, you can check this topic: Authorization letter templates. Depending on the type of documents (degree of privacy required), you could use a specific template. If the documents have confidential content, it’s best you make a personalized Authorization letter. This way, you can quickly modify the text and make it a personal authorization claim letter. Authorization letter to claim drivers license. Save yourself time and efforts and download this Authorization Letter to Claim ID Card now!